Capturing baseball and its relationship to society in the 1960s on and off the field through the experiences of two teams and their two star pitchers. The year 1968 represented the apex of a decade in which pitchers asserted dominance over hitters in Major League Baseball. In that epochal year, two men were ascendant in what was still America’s pastime. Bob Gibson (b. 1935) was the taciturn, intimidating African-American ace for the St. Louis Cardinals. Denny McLain (b. 1944) was the swaggering, self-involved white No. 1 pitcher for the Detroit Tigers. The two led their teams to pennants and a clash in that year’s World Series. The Cardinals were the defending champions, while the Tigers were desperate to reach a level that had recently eluded them. New York Times “Male Animal” columnist Pappu tells this story, but he explores so much more than the battle between two pitchers and their teams. 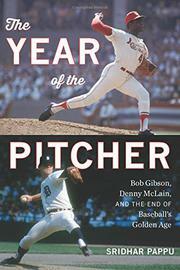 The author is clearly building toward 1968 from the beginning, but in reality, that year was the culmination of longer trends, and Gibson, McLain, and the teams represent a lens through which to view baseball in the 1960s more broadly. Refreshingly, Pappu rejects clichés about baseball saving a struggling Detroit or baseball somehow bringing America together. Instead, the sport tended to follow society more than leading it. Furthermore, despite the subtitle, Pappu does not present a “golden age” narrative. If anything, he rejects such romantic thinking. While Detroit emerged as the winner of the 1968 World Series, it hardly brought a city together beyond the fleeting celebrations that any championship brings. Pappu is especially insightful in his discussions of issues of race that pervaded baseball and American society. While he follows a generally chronological narrative, many of the chapters address themes that require him to go backward and forward in time in ways that both muddle the narrative and occasionally lead him to repeat key facts and arguments. But those are minor quibbles in a solid book. A fine history of a vital period in the history of not only baseball, but America.